Provide oncologists with the lesion management data they need for effective treatment planning. 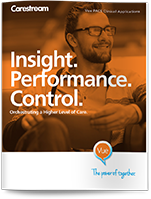 Expanded clinical tool sets and multimedia reporting enable more precise reading, increased productivity and greater clinical insight. 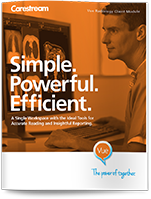 Easily add teleradiology capabilities to provide nonreading hospitals with quality reports. Speed interpretation with multiplanar reconstruction, vascular representation and volume rendering at one click of the mouse. The volumetric PowerViewer enhances the traditional two-dimensional viewer and creates a single, virtual study with real-time 3D volumetric registration of all relevant studies, including priors, with synchronized views across multiple data sets. Create, modify and view 3D images without leaving the source data. 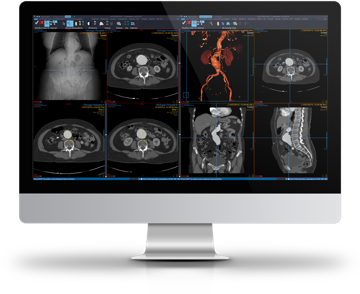 Vue PACS 3D imaging efficiently handles huge data sets, providing remarkable speed and simplicity for displaying current and prior studies side by side and applying 3D tools to both. 3D analysis options include maximum intensity projection (MIP), volume rendering and tissue definition. 2D and 3D-rendered images are automatically loaded to provide a summary of the entire anatomy, with automatic 3D positioning of cross-referencing lines. Improve tumor detection while reducing the time to read and report complex cases. Our Lesion Management application provides integrated follow-up for high-value exams requiring complex treatment planning. Precise lesion measurement and simple comparison of historicals — even across disparate modalities — supports reliable evaluation of metastatic disease and faster assessment of patient response to cancer treatment. Use our interactive CT Perfusion and MR Perfusion tools to analyze tissue blood flow, volume and capillary permeability, with automatic detection of arterial input function, venous output function and brain centerline, and automatic display of results in perfusion maps and tables. The MR Diffusion tool enables visualization of local water diffusion properties, simplifying analysis and comparison of diffusion weighted images and diffusion tensor imaging. See a sample of some of the latest diagnostic tools in our Clinical Collaboration Platform for use in hospitals and imaging centers. These medical clinical tools include neuro measurement and ventrical segmentation tools for neurology.